Wohoo - die neuen Party und Geburtstagstexte, die ich für die Party Animal Kollection von Whiff of Joy designed habe, sind endlich da. Natürlich konnte ich nicht widerstehen und mußte gleich eine Karte basteln. This weeks challenge at the Whiff of Joy Challenge blog is a colour combination "green and purple". Phew!!! That was a real challenge for me, purple is a colour I don't use very often and combining it with green seemed to be an impossible deed ;) But I managed to do it, because I found this adorable paper from Cloud9Design in my drawer. The cute heart with key charm is from Susanne of Embellishments.de I bought a whole lot, she has such a great assortment. (She does ship abroad although it is not stated on the website, just contact Susanne). I did the scalloped border with the new Stampin' up punch. The second sentiment is printed on the computer and means "a boy", I used Su's Word Window punch. Ich habe die geschwungene Kante mit dem neuen Stampin' Up punch gemacht und den Text mit dem Word Window Punch ausgestanzt. Danke, dass ihr heute rein geschaut habt. Vielleicht habt ihr ja Zeit bei der Whiff of Joy Challenge mitzumachen. Paper: Cloud9Design, Su cardstock "bordering blue"
beautiful card, love the colours and the sweet little padlock! Total süß Katharina, richtig goldig! Very elegant card Katherina, I love the cute little charm. A fantastic card Katharina! 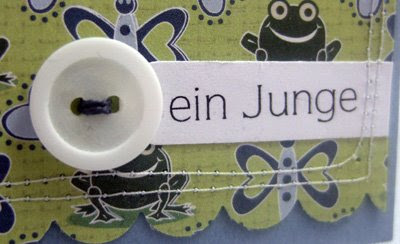 Love that frog paper! Die Karte ist total schön geworden. Der Text gefällt mir. Und danke für den Link. Solch einen Shop habe ich gesucht. Oh,dass ist ja wieder eine ganz tolle Karte und die Schrift ist wahnsinnig schön! Very nice done, I agree with you about the color purple, I don't use it much. OH my Katharina... I just got my package in the mail yesterday (just in time for the challenge) and now I have to order again... the sentiments are great! May have to wait until next pay period. OH and THANK YOU SO MUCH for the donkey... saved in its package as a collectible! But the other one already has ink all over it and I haven't had it 24 hours! hat a lovely card! You did great with the purple!! Such a fabulous congratulations card! Katharina this is wonderful! Those sentiments look fantastic and will be every bit as popular as your other sentiments. I just love the font - Fabulous! Die Kombination grün-lila hab ich schon öfter mal verwendet, nachdem ich bemerkt hab, das das gar nicht so schlecht aussieht. deine karte ist super schön. wo bekommst du diese Charms her?